This post about homemade candy was inspired by a product I received to review at no charge. All opinions expressed are my own. This post contains affiliate links which means if you click on a link and make a purchase I will receive a small amount of money to put towards my blogging adventure. Every year for the past 17 years I have made homemade candy during the holidays. This little adventure started out with just a few homemade candy recipes but has grown over the years to a point where it is slightly out of control. I am up to 17 different candies this year which will make up about 30 boxes and an assortment of trays for family, friends, co workers and teachers. Homemade candy is the perfect gift….it is one that takes time to make and isn’t cheap but I personally love giving homemade gifts during the holidays. Now, let me just say right up front that my homemade candy is NOT green, organic, all natural or even remotely healthy. Personally, I don’t care one whit about those things during the holidays….December is made for artificially flavored candy canes and hot cocoa with tiny marshmallows. I will go back to my green and natural living in January but for now I will enjoy myself! 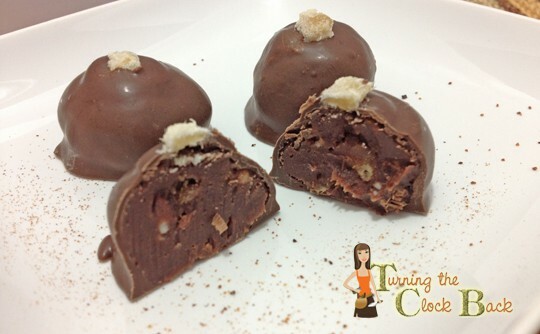 If you wan to see some of my previous adventures in candy making you can check out my Hazelnut Truffles (show above). 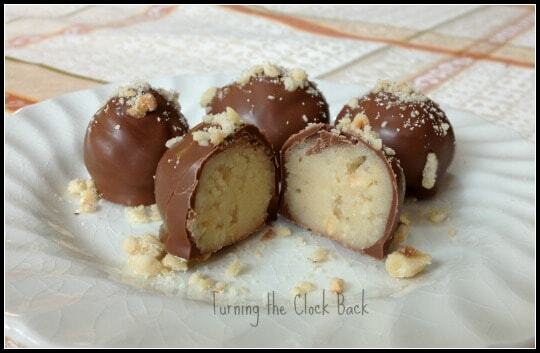 It is one of my favorite homemade candy recipes and is very easy to make! If you want to start making homemade candy there are a few basic supplies and ingredients you are going to need. You absolutely must start with good, high quality chocolate for dipping. I do not use a ‘real’ chocolate that requires tempering….I use a dipping chocolate which melts easily in a double boiler and dries quickly. Personally, I like using Merken’s brand chocolate coating. I feel that it has the best flavor and texture of all the brands I have tried in the past. It is also probably the most expensive of the brands I have tried. You get what you pay for, I promise! You will also need a dipping spoon. Those are easily found at your local craft store like Micheal’s or Joanne’s. 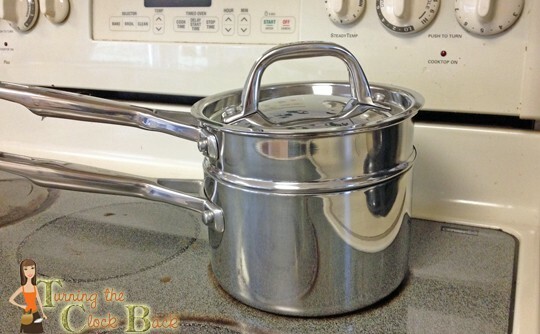 This year I am using a double boiler that I received from Anolon to review. I have used a bowl over a pan of water for many years but it has serious drawbacks. The bowl never sits quite right and the steam comes up around the edges and there is no lid which makes melting time a lot slower. 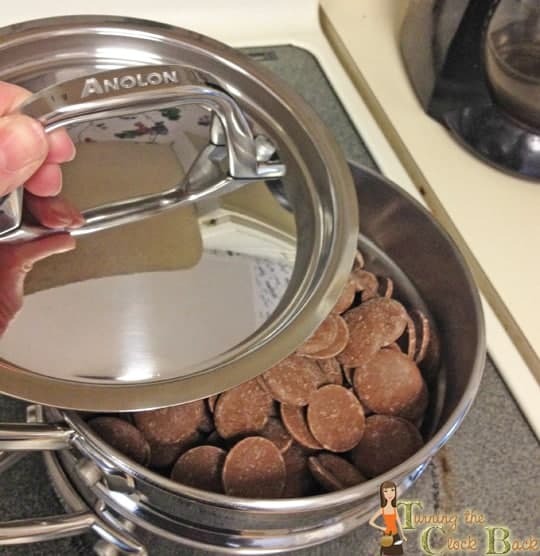 The Anolon Tri-Ply Double Boiler is deep enough to hold plenty of chocolate and the lid makes melting time much quicker. I can easily prop the top pan up a bit if needed to get to the bottom of the chocolate when it starts to run low. I am seriously wondering how I lived without this handy product! If you are considering venturing into the homemade candy business I highly recommend you invest in a double boiler early on! This gingerbread truffle recipe was inspired by a recipe I found on the Epicurious website. I made a few small changes based on personal preference but check out the original if you like. Next year I will probably cut back on the cream a tad bit to make the center a little bit firmer for dipping. It worked just fine the way I have it written below but would be easier to handle if it was a little bit harder after chilling. I found most of the ingredients for this homemade candy recipe in my local grocery store although I did by Crystallized Ginger Chips from Amazon. I have used several products from The Ginger People in the past and absolutely love them. 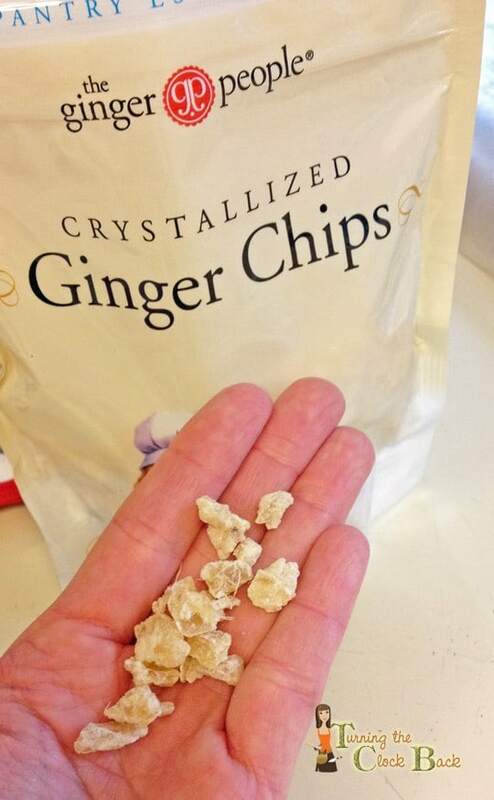 You may be able to find crystallized ginger in the health food store or your local Whole Foods but if not, rest assured you can order it online! I am going to put the rest of it in some homemade ginger snaps soon. If you are looking for creative and tasty homemade gift ideas I hope you consider trying these Gingerbread Truffles. You could also make them up for your next holiday party and serve them with eggnog to friends and family. I guarantee they will be a big hit! 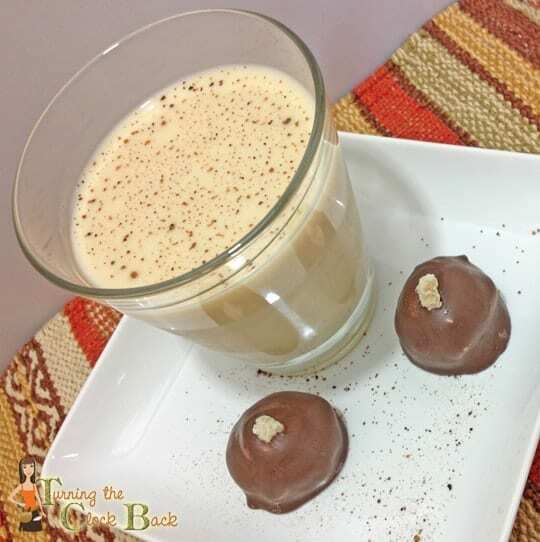 Easy homemade candy recipe with a delicious gingerbread flavor! In a small pan over medium heat combine the heavy cream, whole cloves, whole allspice, cinnamon and ginger. Heat until steam starts to form and tiny bubbles form around the edge of the pan. Remove from heat and let steep for 1 hour and strain. Into a large pan over medium heat combine the strained cream, crystallized ginger, the bittersweet chocolate and the white chocolate. Heat and stir occasionally until melted and smooth. Add a PINCH of ground nutmeg, allspice and cinnamon until center achieves desired taste. Remove center from refrigerator. Using a small (1 inch) cookie scoop, scoop balls onto waxed paper. When all filling is scooped out, dust hands with powdered cocoa and roll center gently but quickly. Repeat until all balls are rolled. Dip each center in melted chocolate using a dipping spoon and drop onto waxed paper. Garnish with a small piece of crystallized ginger and let harden for 30 minutes. Store at room temperature for 1 to 2 weeks if needed. Have you ever made homemade candy? I am always looking for new recipes so please feel free to leave me a link!